THE MINISTER FOR JUSTICE Frances Fitzgerald has this evening rejected a bill put forward by independent TD Shane Ross. The Public Sector Management (Appointment of senior members of Garda Síochana Bill 2014) sets out to have an independent process of appointing senior members of the gardaí. Ross said that structure would be very simple and would ensure that people are appointed on merit. He said that the positions would be advertised and a board of three members from the Standards in Public Office Commission and two new members would report to the Dáil and make a recommendation of a candidate. The Dáil in turn, he said, would either accept or reject that person, and if rejected, the board would then recommend a second candidate. 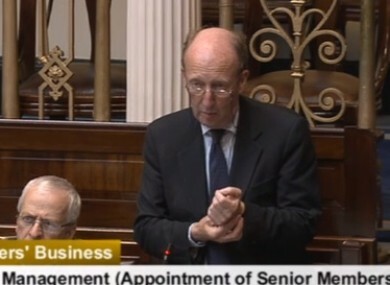 He said that the Dáil committee could also interview the candidate. “It doesn’t go to the Minister for Justice,” he said, stating that it wouldn’t be “nakedly a political appointment”. He said it would apply to the top three members of the gardaí and other senior members. “There is no minister involved here. It is a minister-free zone,” adding that it takes appointments away from the political arena. Ross said the bill also included dismissals, whereby the dismissal of the commissioner would only be able to be done by the Dáil. He said that the recent controversies surrounding the gardaí shows that something is “rotten in the garda”. He asked the minister to consider it. Minister Fitzgerald said that public confidence in the police force is key and said that comprehensive reforms were underway. She said that she had already said on the record that the position of the Garda Commissioner would be advertised, both nationally and internationally. Fitzgerald told Ross that she had already committed to introduce an independent Garda Authority by the end of the year. She welcomed the debate on the appointments of senior gardaí but said that the bill was “premature”. “It must be designed to fit in properly in the new policing regime,” she said, stating that there was no point in introducing reforms in a “piecemeal manner”. She said that all aspects of reform have to “complement” each other. She added that although the details of the new garda authority have to be worked out, it will have an involvement in the appointments of senior members of the gardaí. Fianna Fáil’s Niall Collins says bill completely “misses the point”. He said he was glad the minister was opposing the bill as Fianna Fáil would be too. Email “Ross: 'Senior garda appointments should be a minister-free zone'”. Feedback on “Ross: 'Senior garda appointments should be a minister-free zone'”.